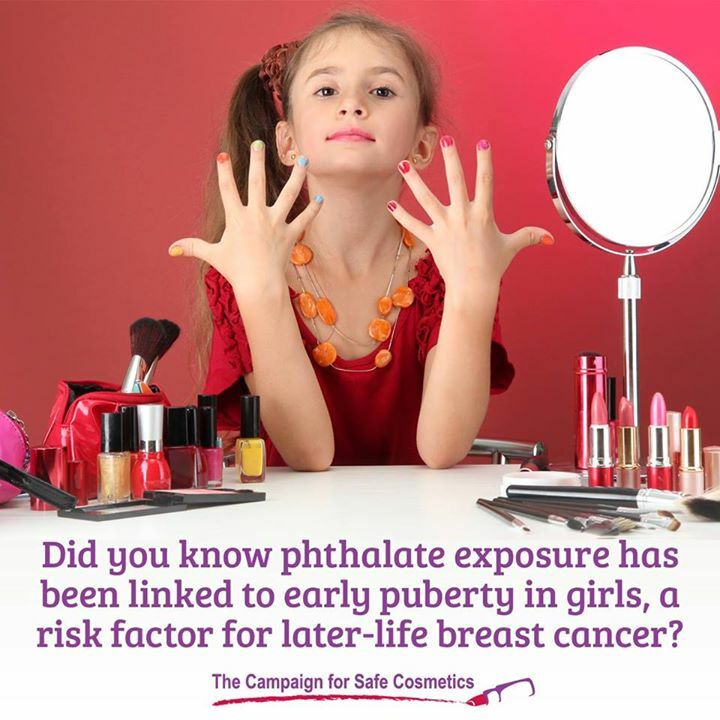 Exposures to even small amounts of some chemicals can increase vulnerability to later life adverse health effects and disease. When it comes to exposures to some chemicals, scientists increasingly discuss ideas such as “timing of exposure” or “windows of susceptibility” during development when the body is especially sensitive to exposures. 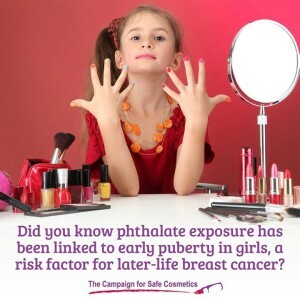 Many personal care products contain chemicals that disrupt hormones. For instance, parabens, common preservatives in cosmetics, and triclosan, a common active ingredient in antibacterial soaps and hand sanitizers, have been shown to disrupt hormones. Historical examples of toxic exposures in humans serve as inadvertent experiments that powerfully illustrate the ways that timing of exposure affects the development of disease. Between 1938 and 1971 doctors prescribed DES for millions of pregnant women to prevent miscarriages, culminating in a medical tragedy that has affected at least 5 million people. Daughters of women who took the drug were found to have higher rates of an extremely rare vaginal cancer, in addition to breast cancer. The drug was banned in 1971. In both of these cases, decades went by with unfettered use of chemicals and resulting widespread exposures, in part because many adult-onset diseases don’t show up until decades later. Exposure to endocrine-disrupting compounds in personal care products could lead to similar interactions between timing and exposure that increase health risks and outcomes in ways that contribute to later life disease. Antshel KM, Waisbren SE (2003). Developmental timing of exposure to elevated levels of phenylalanine is associated with ADHD symptom expression.Journal of Abnormal Child Psychology, 31(6):565-74. Fenton SE (2006). Endocrine-disrupting compounds and mammary gland development: Early exposure and later life consequences. Endocrinology 147 (Suppl): S18-S24. Fenton SE, Hamm JT, Birnbaum LS, Youngblood GL (2002). Persistent abnormalities in the rat mammary gland following gestational and lactational exposure to 2,3,7,8-tetrachlorodibenzo-p-diosin (TCDD). Toxicological Science 67:63-74. Russo J, Hu YF, Silva IDCG, Russo IH (2001). Cancer risk related to mammary gland structure and development. Microscopy Research and Technique 52: 204-223. Li S, Hursting SD, Davis BJ, McLachlan JA, Barrett JC (2003). Environmental exposure, DNA methylation, and gene regulation: Lessons from diethylstilbestrol-induced cancers. Annals of the NY Academy of Sciences.983: 161-169. Colton T, Greenberg ER, Noller K, Resseguie L, Van Bennedom C, Heeren T, Zhang Y (1993). Breast cancer in mothers prescribed diethylstilbestrol in pregnancy. Further follow-up. Journal of the American Medical Association, 269: 2096-2100. Titus-Ernstoff L, Hatch EE, Hoover RN, Palmer J, Greenberg ER, Ricker W, Kaufman R, Noller K, Herbst Al, Colton T, Hartge P (2001). Long-term cancer risk in women given diethylstilbestrol (DES) during pregnancy. British Journal of Cancer, 84: 126-133. Troisi R, Hatch EE, Titus Ernstoff L, Hyer M, Palmer JR, Robboy SJ, Strohsnitter WC, Kaufman R, Herbst AL, Hoover RN. (2007). Cancer risk in women prenatally exposed to diethylstilbestrol. International Journal of Cancer, 121: 356-360. Cohn BA, Wolff MA, Cirillo PM, Sholtz RI (2007). DDT and breast cancer in young women: New data on the significance of age at exposure. Environmental Health Perspectives, 115: 1406-1414. Available online: http://www.ehponline.org/docs/2007/115-10/ss.html#ddta. Accessed August 21, 2008.